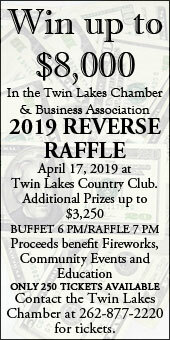 A word from our sponsors: Twin Lakes Area Chamber and Business Association reverse raffle is April 17; Grand Prize is $8,000! Be sure to get your ticket for the 2019 Twin Lakes Area Chamber and Business Association Reverse Raffle. The raffle drawing takes place at the Twin Lakes Country Club on April 17. Buffet dinner at 6 p.m. and drawing starts at 7 p.m.
Grand Prize is $8,000, plus up to $3,250 in additional prizes. Proceeds from the raffle benefit fireworks, community events and education.